Clovis Point From Union County, Illinois. 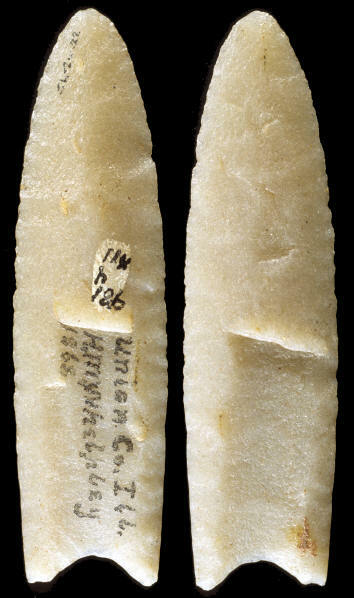 This Clovis point was found in 1868 in Union County, Illinois. It was collected many years ago by H. M. Whelpley of St. Louis, Missouri. It's made from sugar Quartz that might be Hixton from Wisconsin and measures 4 1/2 inches long. 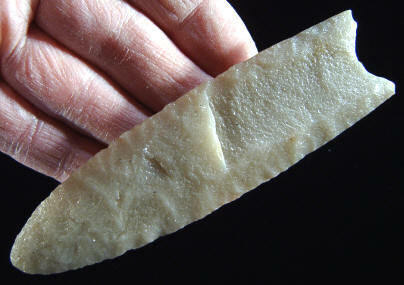 This is a very nice example of an eastern style Clovis point. Both flutes are 2 inches (5.1 cm) long. The flutes are also wide and deep. This picture shows both sides of the original Clovis point from Union County, Illinois.